The sculptural steel wrapper forms a canyon-like entry. A whiteboard-surfaced steel wrapper unfurls from the wall, giving your thoughts room to unfold. When you’re running out of space on the page, your thinking can become cramped as well. The shape of the surface doesn’t quite match the form of the thought. 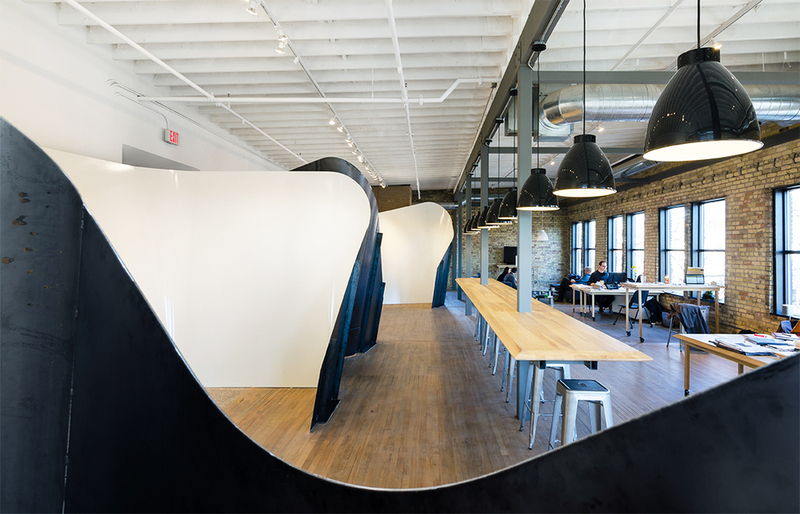 The unrestricted movement of ideas drives the flexible organization of this renovated workspace for a Minneapolis-based design/branding team. The design introduces bold, organic forms while it incorporates the existing wood floor, brick walls, and tall windows. 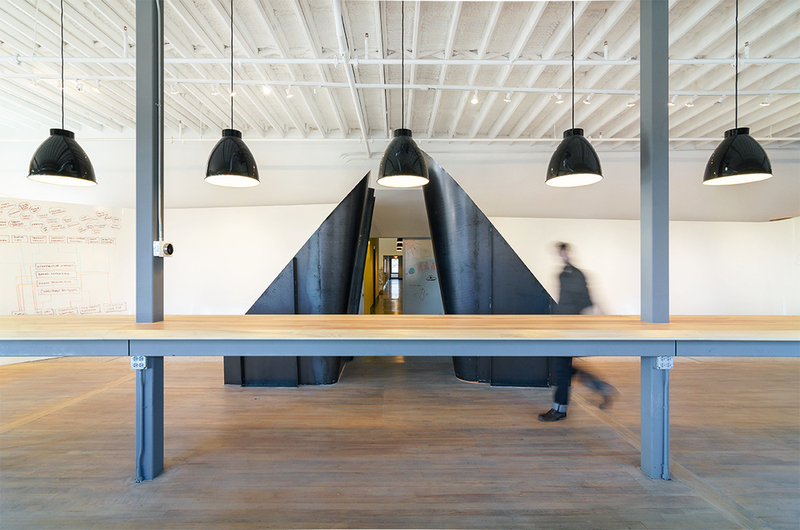 Like an unfurling scroll, whiteboard-surfaced steel peels away from the back wall, curving inward and reaching closer to the ceiling to form a canyon-like entry into the space. Mobile work tables allow groups to gather in different configurations, moving as ideas evolve. A long, fixed work surface anchors the space at a communal core, passing through structural columns. People and ideas orbit this public nucleus, dubbed “central park,” while the steel wrapper protects more private getaway spaces. An enclosed two-person meeting room fits snugly between the wrapper and existing side walls like a nest.